Clayf is one of The Six Legendary Soldiers of Vestroia and is the strongest of all the six soldiers. It battles with a large, multi-pronged lochaber axe that also works as a shield. It absorbs any ability that is given to its opponents during battle. Clayf looks like chubby Japanese Samurai. 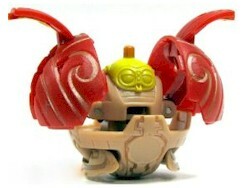 But don't let the look fool you, this uncommon Bakugan has strong abilities. Purchase Clayf from Amazon now!